Welcome to the Carnival of Space, a weekly collection of recent posts from bloggers who write (mostly) on space and astronomy themes. This blog carnival was started in spring 2007, and here we are at number 120. I’ve found so many interesting blogs and learned so much over the last couple of years that I’ve been following and occasionally hosting the carnival of space. I’m happy to be hosting again. Hubble: The recent release of the first images and data from the rejuvenated Hubble Space Telescope inspired several bloggers this week. Cosmic Ray was inspired by images from Hubble’s new WFC3, especially the “stars gone wild” in globular star cluster Omega Centauri. 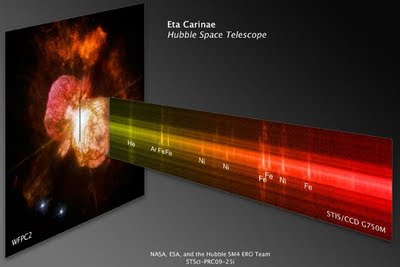 Universe Today’s Nancy Atkinson shares some images that graphically demonstrate how much of an improvement the recent Hubble service mission has made. Bad Astronomy’s Phil Plait gives an informative and emotional overview of Hubble’s new and improved instruments and talks about the special connection he has with his long lost friend STIS. Education & Observation: Starts with a Bang! presents a nice explanation of why sunsets, moonsets, and lunar eclipses show so much red light. Weird Warp offers an excellent post explaining almost everything you might have wanted to know about sunspots. 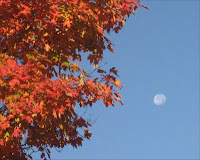 Astroblog talks about finding and observing the Moon in the daytime sky. AstroSwanny discusses the pros and cons of remote or “connected” astronomy. Steve’s Astro Corner tries to improve planet literacy with a mini solar system tour, but unfortunately his daughter’s friends who prompted this remedial effort probably won’t be reading his blog after that party. And Simostronomy takes a break from the technical aspects of variable star observations to reconnect with the simple exquisite beauty of the night sky. The Future: It’s not often that we have a shark specialist contributing to the Carnival of Space, but there is a connection: preserving the planet. David “WhySharksMatter” Shiffman contributes a post on how emerging space-based technologies can improve the lives of everyone on Earth, and alleviate some of the problems facing the oceans. 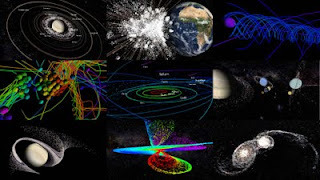 Next Big Future presents an intriguing post whose title speaks for itself “Mach Effect: Interview with Paul March and an Update on the Work of James Woodward (on Mach Lorentz Propulsion, Propellentless 1G Space Drive). And 21st Century Waves reports “Private Funding for the Settlement of Mars Has Begun” with the founding of a private venture called the Martian Trust. Art: Paul Gilster of Centauri Dreams reflects on how space art (often coupled with SF) has inspired him and so many others, and he hopes it can help do this again – “Can art reawaken the spirit of exploration that seems so much on the wane?” CollectSpace revisits the US Post Office’s “first man on the Moon” stamp from 1969 with an interview with the stamp’s designer. Multimedia: In multimedia, we’re glad that Space Video of the Day has returned, this week with a video profile of physicist Stephen Hawking and the quest for a “theory of everything.” Cheap Astronomy weighs in this week with the second of a two-part podcast on NASA’s Constellation program. The first one covered the launch vehicle aspects, and the second one focuses on the Orion and Altair spacecraft. The Rest: Lounge of the Lab Lemming comments on the apparent size of Mars vs. Venus and other (non) amazing astronomical coincidences. Commercial Space reminds us that space is a business and points out that some of the roughly 200 Canadian companies involved with space are doing quite well right now. Habitation Intention says, “welcome to the dip.” This is an interesting approach to trying to understand the public’s general lack of interest in space exploration. Was Apollo a fluke? You’ll have to read and judge for yourself. And in a new post on his re-vamped "Road to Endeavour" blog, Stuart Atkinson looks back at the Mars rover Opportunity's study of a huge and fascinating martian meteorite called "Block Island." Finally my own entry for the week: Even though I wrote the book on “playing in space” (with Orbiter), I’ve just discovered a new way to play in space called Universe Sandbox. Unlike Brian Wilson’s sandbox, there’s no piano (and actually no sand) in this virtual sandbox, just a whole lot of moons, planets, stars, and galaxies I can fling around. It's actually a very cool gravitational simulation program. Thanks to everyone who contributed this week. Thanks, Bruce! There are some incredible posts here. about "founding of a private venture called the Martian Trust"
I can fling around. It's actually a very cool gravitational simulation program. Buy This For Somebody's Kid! Nice to Know It Works!